On this day in 1651, the Battle of Worcester was fought between the Royalist forces of Charles II, most of them Scots, and the Parliamentarian forces of Oliver Cromwell and his New Model Army. Cromwell’s forces outnumbered the Royalists by at least two to one. It was the final battle in Charles’s attempt to retake his father’s kingdom, and Charles’s defeat marked the end of the civil wars that had been going on in England, Scotland, and Ireland for nearly a decade. Until 1649, Scotland’s political establishment had considered the English Parliamentarians to be their allies. Both parties sought to limit royal control: the Parliamentarians believed that the king should be subject to Parliament (or at least willing to work with it), and the Scottish Covenanters believed that he should be subject to God (by which they meant the Assembly of the Presbyterian kirk). However, when the Parliamentarians tried and executed Charles I, Scots of all political stripes were outraged. Charles was, after all, not only King of England – he was King of Scotland, too, and his Scottish subjects felt that England had no right to execute Scotland’s king without a Scottish trial. In response, the Scots proclaimed Charles’s son, currently in exile on the Continent, King Charles II. Cromwell then gathered an army and marched into Scotland, where on 3 September 1650 – a year to the day before the Battle of Worcester – he defeated the Scots at Dunbar and took control of Edinburgh. The younger Charles was brought back to Scotland and crowned at Scone on New Year’s Day, 1651. Like the later Stuart exiles, however, the new king intended to rule all of Britain, not just Scotland. Although his general, David Leslie, urged him to remain in Scotland, where he had the greatest support, Charles decided to take his army into England. Cromwell left part of his forces in Scotland and turned south in pursuit. The Royalists’ march toward London was halted at Worcester. Macalisters at home, too, were affected by this defeat. After Worcester, Cromwell quickly conquered all of Scotland outside the Western Highlands. Scotland was declared a protectorate of England, and the government in London hoped to unite the two countries formally. Discontent among the Western clans (who as Episcopalians and Catholics were excluded from the newly decreed religious toleration) and resistance to military occupation led to Glencairn’s Rising (1654), but after that had been put down, Cromwell’s General Monck “established a measure of law and order in the Highlands which had not been seen for centuries, enforcing it with the active co-operation of the clan chiefs. By offering them treaties of surrender to sign, Monck . . . implicitly recognised their own authority over their clansmen, so bolstering their positions of power.“ In fact, in some ways the Highlanders were better off under Cromwell than they ever had been. Certainly the restoration in 1660 of Charles II “saw a return to widespread disorder”. Still, for nine years after the defeat at the Battle of Worcester, Scotland was a conquered nation, subdued by a military presence and ruled directly from London. Cromwell’s Crowning Mercy: The Battle of Worcester, 1651 (Gloucestershire: Sutton Publishing, 1998), p. 113. An entertaining and informative account of Charles’s escape back to France can be found in Richard Ollard’s book, The Escape of Charles II after the Battle of Worcester (London: Robinson, 1966, 1986). It is well worth reading if this era is of interest. On this day in 1895, Sgt. Henry H. McAllister, a three year veteran of the Manchester, New Hampshire, police department, was shot by former officer Fred Stockwell, to whom McAllister had been supervisor. Bullets struck the sergeant’s aorta, spleen, and kidney, killing him instantly. McAllister was 49. The shooting took place in the police station, and Stockwell, who had resigned a week earlier, was immediately arrested. According to a news report at the time, he had made threats against not only McAllister but also “other members of the department”. However, he had a particular grudge against Sgt. McAllister, who had recently reprimanded him for “intemperance and untruthfulness”, and at the time of the shooting, he said that this was the reason for his crime. Stockwell was sentenced to 30 years in prison for second-degree murder, but in 1914 he was pardoned without explanation and promptly disappeared. Henry McAllister, an Irish immigrant survived only by his sister, was gradually forgotten. Thanks to a current member of the Manchester police force, however, the story does not end there. More than a hundred years after McAllister’s death, Capt. Nick Willard began to wonder why the long-dead sergeant’s name did not appear on New Hampshire’s memorial for policemen killed in the line of duty. He decided to investigate, and he discovered that there was a bit more to the story. Stockwell’s statement that he had killed McAllister because of the charges brought against him seems to have been accepted by everyone at the time, but Capt. Willard learned that Stockwell later changed his story. Several years into his sentence, Stockwell began to claim that McAllister had had an affair with his wife and that was the reason for the shooting. Willard found no evidence to support Stockwell’s claim, and he believes the killer was simply trying to smear his victim’s name. McAllister had no one around to defend him, however, and “over the course of time, the rumor morphed into fact”. Willard concluded that this slur is the main reason McAllister was not included on the memorial, and he put in a request to have McAllister’s name added. In a television interview last June, Willard said he wanted the fallen officer to know that his reputation has been restored and his service with the Manchester Police Department is remembered. On Monday 19 May 2014, 119 years after he died, McAllister was among the 286 officers killed in the line of duty whose sacrifice was recognised in the New Hampshire Law Enforcement Officers Memorial ceremony. New Hampshire Death and Disinterment Records, 1754-1947, online database, Ancestry.com (accessed 19 May 2014); record for Henry McAllister. “A Police Sergeant is Shot Down by an Ex-Policeman”, Sandusky (Ohio) Register, 23 May 1895, p. 2; digital image, Ancestry.com (accessed 20 May 2014); Historical Newspapers Collection. “Fallen Officer to Be Added to NH Law Enforcement Memorial: Sgt. Henry McAllister shot in line of duty in 1895“, news report dated June 13, 2013, WMUR New Hampshire web site (www.wmur.com/news). “ODMP Remembers . . . Sergeant Henry McAllister“, Officer Down Memorial Page web site (www.odmp.org), accessed 20 May 2014. A brief search of online records turned up a family of McAllisters who arrived in the US as famine immigrants in 1850 and settled in Manchester. The family had a son named Henry about the right age; according to McAllister’s death records, the father’s name, and the mother’s maiden name, are also right. If this is indeed Sgt. McAllister’s family, then his mother also survived him—although not by long: That woman died in 1898 “from Melancholia” [New Hampshire Death and Disinterment Records, 1754-1947, online database, Ancestry.com (accessed 19 May 2014); record for Jane McClelland McAllister]. However, none of the names involved are particularly unusual and it is very possible that these records pertain to an entirely different family. If McAllister left his homeland as an adult, it is also possible that he had family in Ireland. “Fallen Officer”, WMUR New Hampshire. “New Hampshire Law Enforcement Officers Memorial“, press release dated May 1, 2014, state of New Hampshire government web site (https://www.nh.gov). On this day in 1640, Sir William Alexander, 1st Earl of Stirling, died in London, bankrupt. Sir William belonged to the Menstrie family, whose exact origins are unclear but who have always been recognised as a branch of the Clann Alasdair (the Macalisters). He was to be the most prominent of that family. He was well educated, a noted poet and a close friend of the Earl of Argyll, who introduced him to King James VI. The king also became a friend, and Sir William followed him to London in 1603. He was tutor to both of James’s crown princes, collaborated with the king on a version of the Psalms of David, and held numerous important posts under both James and his son, Charles I, including Secretary of Scotland. In 1621, James gave him an extensive land grant in North America, and Sir William set about establishing a colony there, which he called New Scotland. Today it is the province of Nova Scotia. Sir William’s close association with the royal family continued throughout his life, but in the reign of Charles I his fortunes began to change. Articles of peace signed in 1629 to end a war with France ultimately involved the return to France of the lands on which New Scotland had been established. Sir William’s personal fortune had been significantly reduced in the effort to establish the colony and promised compensation never materialised. Although he spent the rest of his life trying to restore the family’s wealth, he was never able to do so. (Even if he’d managed, political changes were brewing in Scotland and England that would sweep his royal patron from the throne and would probably have left his family ruined.) Added to financial disaster was personal loss: his two eldest sons died within a year of each other. The disappointments which he had met in his colonial undertakings, the melancholy aspect of the civil affairs of the nation, especially the dark and menacing cloud that hung over his native Scotland, . . . the sudden death of his eldest son, in whom were wrapt up his chief hopes for maintaining the distinction of the family for which he had assiduously labored so many years, the financial embarrassments that had been gradually accumulating, and were now overwhelming his private fortune, all these burdens . . . were more than he could well sustain. Sir William Alexander’s body was taken home to Scotland, where he was buried in the Grey Friars’ Church in Stirling. The date is debated, but most reputable sources agree it was in February and this seems to be the generally accepted date. This version of the Psalms later formed a part of the prayer book that Charles attempted to impose on Scotland, sparking the Bishop’s wars (Edmund F Slafter, Sir William Alexander and American Colonization. . . . [Boston: the Prince Society, 1873], pp. 14-5). The third son, Robert, had already died. On this day in 1959, Harry Hill McAlister died at the age of 84. McAlister, who was born in Nashville in 1875, served as Tennessee’s governor from 1933 to 1937. 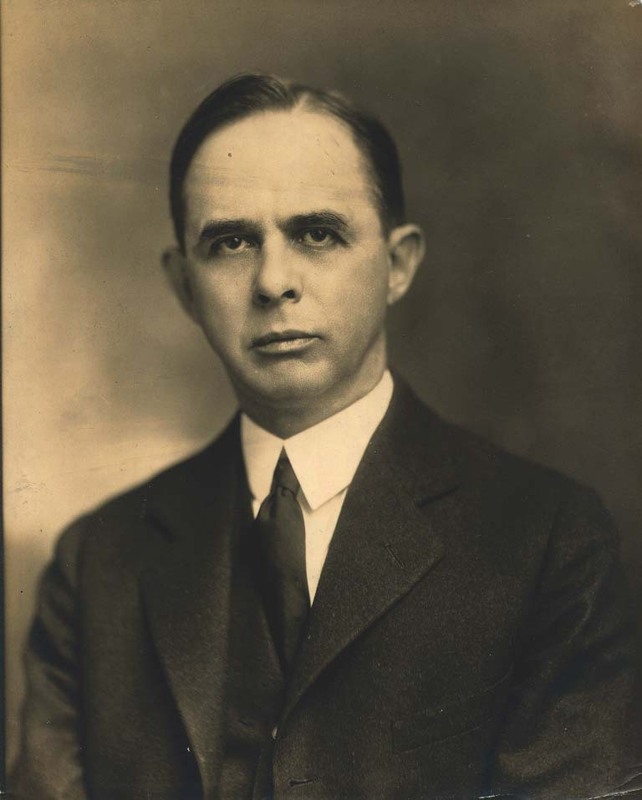 He began his political career as the city attorney for Nashville, and in the 1920s he served as state treasurer before being elected for two terms in the state senate. During this decade, he warned repeatedly that the state was facing a financial crisis – and this was before the stock market crashed in 1929. When Governor McAlister took office, the country was in the grips of the Great Depression and Tennessee had an operating deficit of $6 million. Many banks and businesses had failed. McAlister sharply cut back expenditures, reducing state spending by $7 million, and worked to restore trust in the banks. In his first term, he managed to balance the state budget. He also worked closely with the federal government to implement many of Roosevelt’s New Deal programmes in Tennessee, putting people back to work and developing the state’s infrastructure. In 1934, he was reelected by a significant majority. During his second term, Governor McAlister fell out with Ed H. Crump, a Memphis political ‘boss’ who had been his primary supporter to that point. The former allies disagreed on the repeal of prohibition (McAlister was reluctant to follow the federal government’s example and overturn the law) and on a sales tax that the governor hoped to introduce as a means of reducing debt and helping underfunded public schools. Crump’s associates in the state legislature defeated the sales tax, and with Crump now in opposition, McAlister decided not to run for a third term. He retired from political life after only four years as governor. But he had accomplished a lot in those four years. McAlister had managed to turn Tennessee’s disastrous finances around, and he left the state in better shape economically than it had been in when he took office – no small feat in the midst of the century’s worst economic crisis. Pierce, Dan, “Hill McAlister”, in Tennessee Encyclopedia of History and Culture, accessed 29 October 2013. National Governors Association, Tennessee Governor Harry Hill McAlister, accessed 29 October 2013. On this day in 1899, the second Anglo-Boer War began. This war was the culmination of nearly a century of conflict between the British settlers and colonial authorities in South Africa and the Boers, descendants of Dutch traders established there for centuries. Many Macalisters fought for the empire. Tensions in South Africa had worsened considerably since the end of the first Anglo-Boer War (1880-1). The Boers felt increasingly insecure in their two nominally self-governing republics. They objected to the sudden influx of ‘uitlanders’ (non-Boer settlers) that followed the discovery of gold in Transvaal (one of the Boer republics), and recent movements of British troops appeared sinister to many of them, especially in light of an attempted 1895 coup by Cecil Rhodes. On its part, in an era of competing empires the British government was nervous about attempts by Germans in the southwest of Africa to link up with the Boer republics — particularly with potential profits from the Transvaal mines up for grabs. An ultimatum was presented to the British government on the 9th of October listing the demands of the Boers; the British government, to whom the demands seemed very much like a declaration of independence, replied that “the conditions demanded by the Government of the South African Republic are such that Her Majesty’s Government deem it impossible to discuss”. To the Boers, this refusal amounted to a declaration of war. Ultimately, the result of the war that began on this day was a united South Africa under British rule. But things got pretty nasty before then. The Boers resorted to guerrilla warfare, for which imperial forces were ill prepared, and quickly inflicted several defeats which stunned the British public. In return, British authorities undertook a scorched-earth policy that destroyed Boer farms and sent thousands of displaced civilians (mostly women and children) to concentration camps, where epidemics wiped many of them out. These tactics cut Boer forces off from needed supplies, and the widespread suffering that resulted eventually brought the Boers to negotiation. However, the immediate result of Britain’s rejection of Boer demands was a Boer offensive on Natal, one of the areas under British control. Before long, imperial forces from Britain and several colonies were headed for South Africa. Even with limited access to South African records, I have found nearly 100 Macalisters (of various spellings) among them. This number included Charles Godfrey Somerville McAlester, the future clan chief, who was captain of the 3rd Battalion Royal Scots Fusiliers. Two McAllisters, both named William (but with different service numbers), arrived from Australia with the Army Medical Corps, and there were several of the name from New Zealand and Canada. Others of this clan fought with imperial units from Britain, Ireland, and British South Africa itself. Macalisters were among the early casualties as well. Lance Corporal A McAllister of the Scots Guard was wounded in November, and Private D McAllister of the Highland Light Infantry was wounded 11 December; Private J McAllister and Private P McAllister of the Royal Irish Rifles were the first of quite a few of this name to be taken prisoner when they were captured on 10 December. (Their fate is unclear, although most of the Macalisters captured during this war appear to have been released.) Over the course of the three-year war, nearly twenty Macalisters were wounded, five of them fatally: Trooper Angus Ian Macalister (Imperial Yeomanry), Private A McAllister (Liverpool Regiment), Private J McAllister (Royal Irish Rifles), Private W McAllister and Private J McCallister (both of the Cameronians, or Scottish Rifles). Additionally at least one, Corporal Arthur McAllister of the Imperial Yeomanry, died in an accident, at Standerton in September 1901. Less gloriously, Trooper H McAllister of Thorneycroft’s Mounted Infantry was discharged for misconduct on the 8th of December 1899. The second Anglo-Boer War ended on 31 May 1902 with the Treaty of Vereeniging. Hugh Williams & Frederick Charles Hicks, eds., Selected Official Documents of the South African Republic and Great Britain: A documentary perspective of the causes of the war in South Africa, 1900 (available on line at Project Gutenberg and the Anglo Boer War website), preface. The Boer Wars; see Lawrence James, Rise and Fall of the British Empire (New York, 1994), pp. 263-5. War Service of Officers, 1905. In addition, W Macalister Hall, 4th regiment of the Argyll & Sutherland Highlanders, and E J McAllister, Army Service Corps, were captains of their units. Most of this information is taken from the Anglo Boer War website, which is an excellent source of information about this conflict, and UK, Casualties of the Boer War, 1899-1902 at Ancestry.com. On this day in 1909, ‘Little’ Mary McAllister, whom Hans J. Wollstein calls “the First Baby Star of the Films”, was born in Los Angeles, the grand-daughter of two Scotsmen. Mary appeared in her first silent film short, Despair (1915), at the age of six and went on to make a total of forty-four films in her fifteen-year career. Newspaper mentions make it clear that she was quite the media darling, loved by children particularly but also doing her part for society as a whole. During the First World War, for example, she was made a (presumably honorary) sergeant in the US Army by President Woodrow Wilson in recognition of her work encouraging recruitment in Chicago. In addition to appearing on the silver screen, Mary starred on stage, most notably as the lead in a travelling production of ‘the Little Princess’, based on Frances Hodgson Burnett’s classic children’s story. When Essanay Studios folded in 1918, Mary went back to school, disappearing from the public eye just long enough for questions to begin about what had happened to her. But after graduating from Hollywood High she was back, no longer ‘Little’ Mary McAllister, destined to appear as an adult in 15 further films. Once again she was in the spotlight, appearing at various public events and now the focus of speculation about romances with costars. She was named one of the WAMPAS Baby Stars for 1927, and her future in cinema seemed preordained. Yet it was not to be. After a minor role in the 1930 film On the Level when she was only 21, Mary never appeared on screen again. At this time, of course, silent films were being replaced by ‘talkies’, and several online biographies conclude that she was unable to make the transition to the new medium. In fact, it seems that Mary simply retired to lead a private life. She married businessman Robert Brigham in 1930, the year of her final film; she and Robert had two children, and the family evidently travelled extensively. Mary’s occasional appearances on stage after this were, according to author George Katchmer, “just for fun”. Her marriage appears to have ended in the early 1950s, just as her son’s was beginning, but she lived on for another four decades, dying of cancer in 1991. Mary McAllister died in Del Mar, California, and was cremated. Hans J. Wollstein, ‘Mary McAllister, Actor’, New York Times website. ‘Tiny Film Favorite Vies with Vaudeville Artists for Favor’, Nevada State Journal, 17 September 1917. ‘Little Film Star to Be Recruit Speaker’, Oakland Tribune, 14 October 1919; Nevada State Journal, 17 September 1917. G. Katchmer, A Biographical Dictionary of Silent Film Western Actors and Actresses (McFarland, 2009), p. 241. On this day in 1888, a prohibition order was granted in New Zealand against Archibald McAlister. McAlister, a remittance man, had been ‘wasting his substance’, and the agents to whom his money was sent wanted it stopped. ‘Remittance man’ is not a term heard very often anymore, but in the 19th and early 20th centuries he was a well-known figure throughout the British Empire. Usually from well-off middle class or aristocratic families, these were men who for various reasons were sent abroad and literally paid not to go home. Many of them had disgraced themselves in one way or another, and their families hoped to avoid further scandal. But others have been described as ‘extraneous‘ sons, those who through no fault of their own simply could not be provided for in Britain, where traditional disdain among the upper classes for business or labour was clashing with new realities like the drop in child mortality: Many well-off families found themselves with too many adult children to provide for in socially acceptable ways. Whatever his story, the hope was that the remittance man would make something of himself in his new home, and some of them certainly did. Some were able to adapt to an entirely new mode of existence and with perseverance and a bit of luck became successful ranch owners, entrepreneurs or businessmen; at least one who went to Canada ended up in local government. A new start in the far-flung empire was no guarantee of a better life, however, and the stereotype of a well-bred wastrel was in many cases well founded. In 1894 a New Zealand newspaper article complained that “Many otherwise sane and intelligent persons in the Old Country are firmly impressed with the belief that the man who has failed utterly to make his mark (or even his bread and cheese) in England, has only to set foot in Greater Britain to straightway become a dazzling success”. Those who had already developed bad habits, or who had never lived without luxury and convenience, were ill equipped to face the demands of their new lives. In many cases these men conformed to expectations, frittering away their lives and money in drink, running up gambling debts, even falling afoul of the law. They did not work – perhaps some didn’t know how to do – and resented their situation. Quite a few of them ultimately took their own lives. Even for those who accepted their lot and came to love their new homes, it must have been a bittersweet contentment, as illustrated in The Rhyme of the Remittance Man. The fate of our Archibald McAlister is unclear. There are several of the name in New Zealand in the early 20th century, and I was unable to trace him with any certainty, but the name appears in news reports repeatedly over the next twenty years, mostly in the north island, almost always in connection with prohibition orders and drunkenness. Mataura Ensign, Volume 10, Issue 757, 23 March 1888, p. 5; thanks to Helen Leggatt, whose blog Hunting Kiwis first directed me to the article about Archibald. Many of the articles I found about remittance men in my research for this post were obituaries for suicides. ¡Feliz Cumpleaños! to argentino footballer Carlos Javier MacAllister, who represented his country three times in international matches during his career. He was born in Santa Rosa, La Pampa, Argentina, on this day in 1968. As his name suggests, MacAllister is one of an estimated 100,000 argentinos of Scottish descent. According to a recent article in the Scottish Times, Argentina has the largest such population outside the English-speaking world. Scots began to settle in Argentina in the first quarter of the 19th century. Some of the earliest, more than 200 people, arrived in 1825 as part of a planned settlement, only to discover that the arrangements made for them had fallen through and they would have to fend for themselves. There were no Macalisters in that unhappy group, but the name begins to appear in local records not long afterwards. In 1832, for example, Parlane M’Alister & Co. donated $1000 towards the building of the Scotch Presbyterian Church in Buenos Aires – the ‘& Co.’ suggests that this M’Alister had business as well as spiritual investments there. Two years later Robert Macalister of Paisley, Scotland, married Anne Downes at the British Episcopal Church in the same city. Both parties gave Buenos Aires as their regular residence. By 1850, Macalisters were being born in the province, most of them with Spanish names. Some of them were the children of people whose own names have obviously been ‘Spanished’ and were probably immigrants, but others have at least one parent who appears to be Argentine, suggesting that the Macalister settlers were already marrying into the local population. In fact, most of the Scottish immigrants to Argentina appear to have assimilated quite thoroughly. Their descendants are argentinos – but their names, like that of Carlos Javier MacAllister, give them away. John Fitzpatrick, ‘Scots in South America: The Forgotten Diaspora‘, in the Scottish Times, 3 April 2012. James Dodds, Records of Scottish Settlers on the River Plate and their Churches, 1897, p. 190. Jeremy Howat, ‘St. John’s Marriages, 1833-1839’, from British Settlers in Argentina and Uruguay, Studies in 19th and 20th Century Emigration, accessed 3 March 2013. On this day in 1939, New Zealand Crown Prosecutor H J Macalister obtained the first conviction in that country based exclusively on the evidence of fingerprints found at the scene of a crime. Macalister successfully prosecuted Sandford Robert Young for breaking into an office and stealing a safe. Fingerprinting as a method of identification had been investigated in the 1800s by several different people working independently of one another.The possibility that it could be used to identify criminals was first asserted by Dr Henry Faulds in the October 1880 issue of Nature magazine, sparking a feud with another pioneer, William Herschel; twelve years later Francis Galton advanced the argument in his book Finger Prints. Despite their research, it took years for police forces to adopt the technique. By 1939, fingerprints had already been used as evidence in New Zealand, most notably in a murder case heard by the Auckland Supreme Court in 1920. In that case, however, other evidence was also presented, including the discovery of stolen articles near the home of the accused and forensic evidence tying bullets found in the victim to his gun. The accused had also been seen near the scene of the crime by a prison warden who knew him from a previous sentence. In the case prosecuted by Mr Macalister, the only evidence presented was the identification of fingerprints belonging to the accused on pieces of broken glass at the point of entry. The case was heard at the Supreme Court in Invercargill, where a jury found Mr Young guilty as charged. According to ‘History on Fingerprints‘, fingerprints as a means of identification were used much earlier in China and had briefly been considered in the West in the late 1600s.